Leather Desk Pen/ Pencil Holder,YAPISHI Faux Leather 4 Divided Compartments Desktop Organizer Office Desk Accessories Container Box(Black) by YAPISHI at Transparent University. MPN: APS00003. Hurry! Limited time offer. Offer valid only while supplies last. Why choose YAPISHI PU Leather Multi-funcition Double pencil Holder?1.Sturdy and durable; MDF structure covered by high quality PU faux leather.2. Why choose YAPISHI PU Leather Multi-funcition Double pencil Holder? 1.Sturdy and durable; MDF structure covered by high quality PU faux leather. 2. Simple designed. Perfect to hold pen/pencils/stationery/remote control/bussiness cards in an effectiveway. YAPISHI is owned by APS please make sure you place the order from the correct seller to protect your warranty in the future. 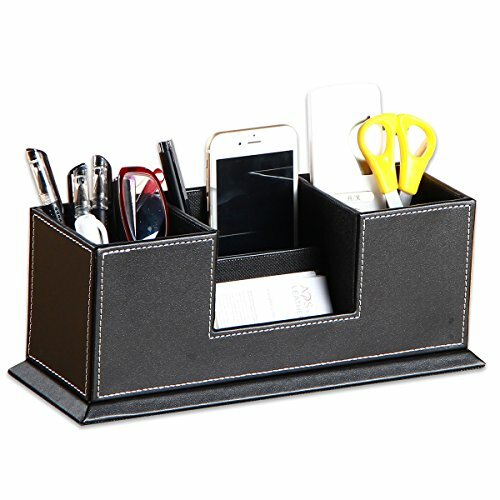 Exquisite workmanship：PU Leather Office supplies Double pencil Holder Stroage Box Desk Catchall Stroage Stationery Organizer. Elegant design：4 departments can holder different office supplies, like remote controls/cell phone/pen/pencils/name cards and anything else. Widely used：Made of high density wooden board and PU leather, durable and sturdy. Applications：Simple designed. Perfect to control desktop tidiness and item classificationin in an effective way.